As a young girl in Italy, Frances dreamed of being a missionary. She grew up to be a bundle of energy, teaching and nursing wherever she was needed. She started a new order of sisters called the Missionary Sisters of the Sacred Heart. She became Mother Cabrini and her unwavering faith never failed. The order grew and her success was noticed. The pope himself offered her the chance to fulfill her missionary dream and go to America. In 1889, the sisters arrived in New York to take care of the Italian immigrants. Mother Cabrini would make 25 trips across the ocean in her lifetime. She was a non-stop dynamo opening schools, orphanages, hospitals and other charitable institutions everywhere she went. She asked Jesus to give her a heart as big as the universe and she gave it all to the poor and sick in the United States and Central and South America. In 1909, she became a US citizen. She raced from place to place without a care and left the rest up to God. 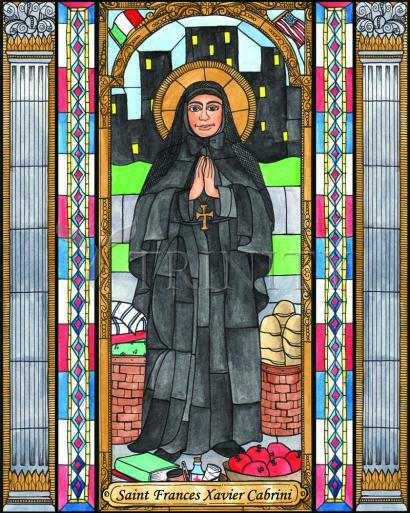 She was the first US citizen to become a Saint. Her feast day is November 13.